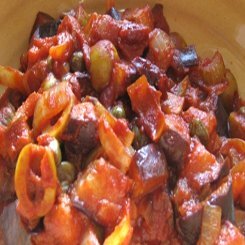 In a pan on a medium to high heat, add about 3 tablespoons olive oil add the eggplant cubes and cook until they are browned. remove from the pan leaving as much of the oil as possible and drain on kitchen paper. To the same pan, add the onions and fry until they are browned and soft, this should take about 10-15 minutes. Now add the celery and cook for about another 4-5 minutes, add the tomatoes with their liquid, the vinegar, cater sugar, olives and capers, mix and allow to simmer for 5 minutes or so. Finally add the eggplant to the mixture and simmer with the lid off for another 10 minutes, taste and season with pepper and salt. 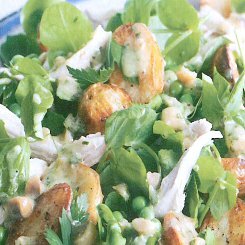 It is best to make this salad the day before and leave it in the fridge overnight before serving, the flavours all meld together beautifully. Remove from the fridge an hour or so before serving if you are having it cold or pop in the micro for a few minutes if you are having it warm. 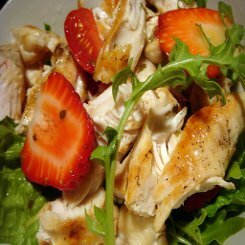 I came across this interesting idea on for the love of cooking blog and just had to try it! Pastry for whatever reason is not a favorite of mine to make so when the idea to use potato slices as a base for a quiche came along, it was like a godsend. 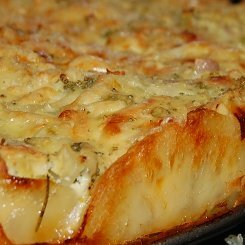 It turned out like a gourmet potato bake with wonderful crisped up edges and is on my all time favorite list from now on. (4 people easily) I used a 29cm springform cake tin to make it in so I could remove it easily and would recommend it unless you are going to serve from the dish. Oil the cake tin with spray and cook or a bit of olive oil. Line the base and sides of the cake tin about 5 cm up the side with the sliced potatoes, overlap them and press them down quite firmly. If you have an oil spray, spray a little olive oil onto the potatoes and pop into the oven for about 10 minutes or so to settle to base. Remove and set aside. While the potato is cooking, fry the onions, mushrooms and ham on a medium heat in a little oil until softened. Beat the eggs and milk well, season with salt and pepper. Sprinkle over the potato base along with the cheese and then pour the egg mixture slowly into the potato shell. Bake for 30 minutes on the middle rack. Test it by pressing down on the center, it should be a little springy and not soft. 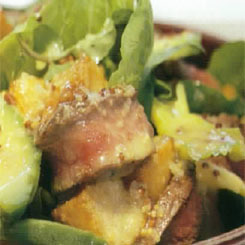 Allow to cool down for about 5 minutes before removing the sides of the tin and serve with a salad! A really great meal a bit like a really fancy potato bake! In a bowl add the spring onions, about 2 tablespoons of olive oil, garlic, mustard and tarragon, then season well with salt and pepper, mix together and toss in the chicken pieces. Toss them around a bit to cover the chicken pieces like a marinade. Set them aside for about 4 hours. 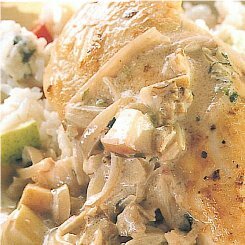 Remove the chicken pieces and shake off any onions. Cook the chicken pieces on a high heat for about 3-4 minutes on each side to brown nicely. Remove and set aside. Now reduce the heat to medium add all of the marinade to the pan, add the chicken stock and the flour and mix well, add the apples and walnuts and allow to simmer for 5 minutes stirring from time to time. 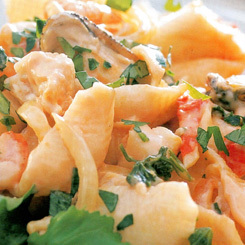 Add the cream and the chicken pieces and simmer for another 2-3 minutes and remove from the heat. In a separate bowl add all of the rice salad ingredients, mix them with a fork to separate the rice grains and distribute the colours evenly. That’s it, serve the chicken over the rice salad with a bit of the sauce. It’s a party in your mouth I tell you. 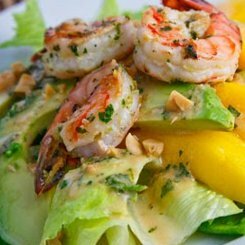 Make the Caesar dressing by adding all of the ingredients except the oil to your belnder and whizzing until smooth. Then start adding the oil in a constant stream while blending until it thickens up. 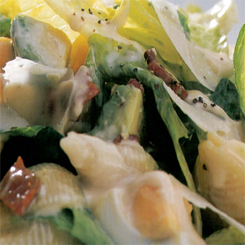 Make up your salad ripping the lettuce into bite size pieces, add the bacon, pasta shells and avocado then toss. Now add the eggs, drizzle over the dressing and shave a whole heap of parmesan over the top. If you are using chicken toss it in with the avocado. 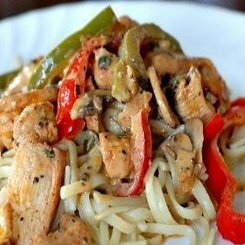 For a really fantastic change add 2 cooked chicken breasts that have been chopped up for a fabulous, chicken caesar pasta salad.